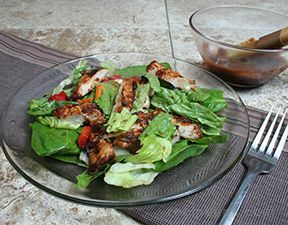 Dressing: Combine barbecue sauce, olive oil, lime juice, and red wine vinegar. Whisk together. In bowl, place mixed greens. Top with red beans, garbanzo beans, corn, sliced peppers, radishes, red onion, and tomato. Add cooked, chopped chicken. Toss to combine. Pour dressing over right before serving. Toss to combine. Sprinkle crushed chips over top and cheese. 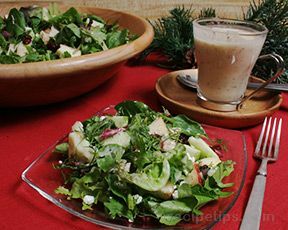 *Can make ahead but don't pour on dressing until ready to serve, along with chips. 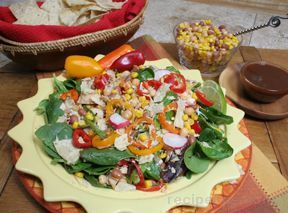 "We just love this recipe as a fun & fresh take on a chicken salad. 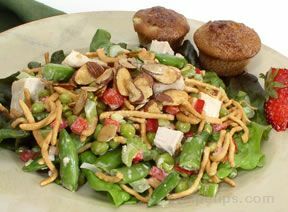 The BBQ sauce adds a nice tang and it helps make this salad a full meal!"